This is either in your own home or at a safe enclosed location. This is a 1-2-1 consultation service. Whether you need training or behavioural advice, we can help. Lessons are intensive, but definitely not dull! IT IS VERY IMPORTANT THAT OWNERS HAVE TIME MID WAY AND AT THE END OF THE COURSE FOR LESSONS TO ENSURE OWNERS AND DOGS UNDERSTAND WHAT THEY NEED TO DO. It would be pointless and a waste of your money to pay us to train them and just give them back to you without you both having some lessons together. We take your dog into our home and they live as part of the family or they might stay in our approved and monitored kennels facility. This course is for a minimum of two weeks when they will go through an intensive programme. As they live with us and our dogs as part of the family, they will also learn house rules and manners taught by us, and our dogs. Dogs need to be at least 6 months old and no older than two to qualify for this course. At the end of the course we are available on the phone to advise if you are having problems; so there is no excuse if you cant get your dog to do what you tell them to! 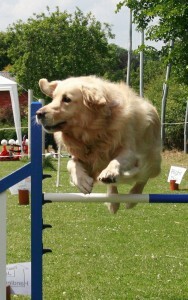 Rally Obedience is the latest dog sport to arrive from the USA. Dogs and their handlers negotiate a course with numbered signs indicating different exercises to perform, such as Sit, Serpentine once, send over jump, fast forward from Sit and About turn right. Handlers are encouraged to talk to their dogs and reward during the performance. Rally O is described as combining the characteristics of sports car racing, dog agility and traditional obedience into a new fun sport. The best part is that as long as your dog has a basic level of training you can take part and have a go. Courses are run throughout the year. Each course is 8 weeks long. If you are interested in attending please go to our ‘Contact Us’ page.